Neighbors living around a home that burned down in Los Angeles a week ago suspect squatters started the fire. 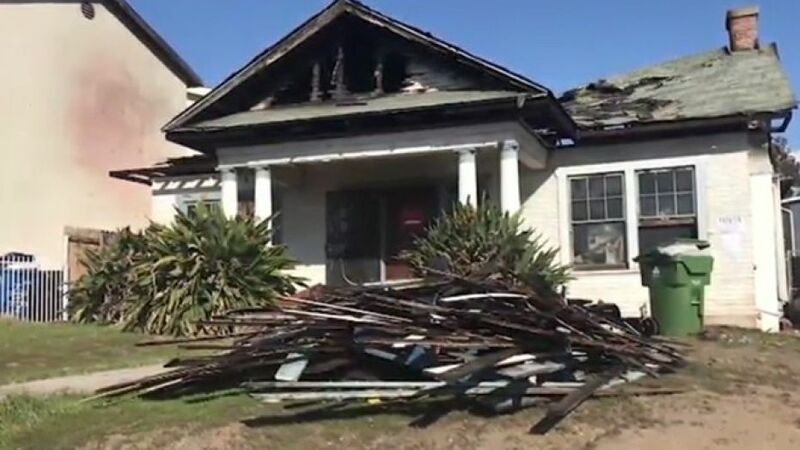 Neighbors living around an abandoned Los Angeles home engulfed by a fire last week suspect the blaze was started by a group of squatters who were using it as a meth lab. They now fear the unsightly property – which has debris piled up on the front lawn – will attract more trouble. The situation brewing on a street in East Hollywood comes as the state is fighting a homelessness crisis, with encampments steadily expanding across the downtown areas of San Diego, Los Angeles and San Francisco. Tucker Morrison, another neighbor, told the station that the house has become a magnet for transients in recent years and he has spotted men leaving the property with ingredients used for the production of methamphetamines. “To the best of my knowledge it’s been squatters living there on and off for about a year and a half, but recently over the last month it’s been guys wheeling out a lot of kitty litter and a lot of weird smells coming from the house, we’re suspecting its meth,” he said. The couple living across the street from the burned-out structure also told Fox 11 they fear it will attract more unwanted visitors and cause property values to plummet. The station said the absentee owners of the home are apparently elderly or unwilling or able to secure the property for the time being. “We are aware of the situation and we’re working with the LAPD, Neighborhood Prosecutor, and Building and Safety to address the issue,” said a spokesman for City Councilman Mitch O’Farrell. Police have not yet taken into custody anyone involved in the blaze and the local fire department hasn’t announced a cause. The city’s building and safety department has posted a “Do Not Enter” sign on the property. It also said it’s notifying the owners that they are responsible for securing the property within 10 days or else Los Angeles will do it for them and send a bill. The specter of homelessness expanding in California and the health problems associated with encampments has led one southern community to take tough action to dismantle a two-mile-long camp just a short drive from Disneyland, Fox News reported on Monday. San Francisco’s feces problem is so bad that a website now exists to warn residents of which streets to avoid. Los Angeles raised taxes last year in order to build housing for the homeless and has started a roving toilet program. Fox News’ Tori Richards contributed to this report.